In rare circumstances, you may wish to delete a book from your Booktype server or Booktype Pro account. 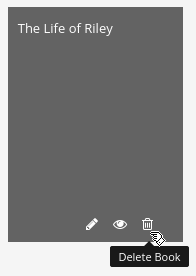 To initiate deletion, either click the Delete Book symbol on the book's icon in My Dashboard, or click the Delete Book button on the relevant Book Details page. (If you do not see the trashcan icon in My Dashboard, it means the book belongs to someone else). The Delete Book dialog will appear. As a safeguard against careless deletion of books, you will be asked to type the full title of the book into the dialog before you are allowed to delete the book. 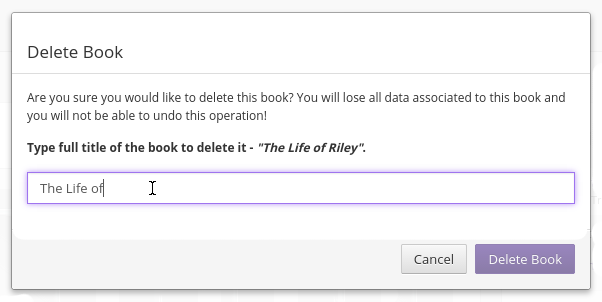 Deleting a book in Booktype is an irreversible process. All the data associated with the book will be lost.